Peter von Bleichert Archive - Bleichert & Co. Written by Dr. Peter von Bleichert, the great-great grandson of the company’s founder, this book includes over 100 pictures, many of them are coloured, and detailed engineering drawings that explore the legendary company’s history, and several of its record-holding systems mentioned above, thereof specifically illustrated are the Cablecarril Chilecito of La Rioja province in Argentina, the over water mining material tramway in Thio (New Caledonia), the wood material tramway of Mkumbra (Tansania) and last but not least the passenger aerial ropeway of the Zugspitze (Austria). Dr. Peter von Bleichert, born in New York City, has lived in Puerto Rico, Greece, and England, and currently resides in California, USA where he is a college professor and writer and where he lives with his wife and daughter. Besides fantasy and science fiction, Pete loves to read military techno-thrillers and loves to write them even more (i.e. Crown Jewel (The Battle for the Falklands/Book1) and Dragon Fire (The Battle for the Falklands/Book 2) or Fourth Crisis (The Battle for Taiwan). He holds a graduate degree in international relations, a doctorate in public policy / homeland security, and has written for various organizations, including the Royal United Services Institute for Defence Studies and the U.S. Naval Institute. He is now working on his next book. Who should be interested in reading this book, here is the German version, which can be ordered from Amazon/Germany: Bleichert-Drahtseilbahnen. 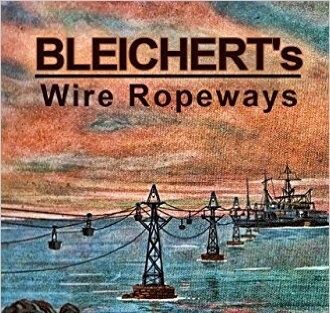 In case you would prefer the English version, please go to: Bleichert’s Wire Ropeways. Kindle Edition 2014 (189 pages). 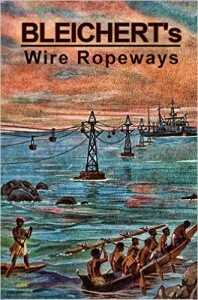 Please also visit „Bleichert’s Wire Ropeways“ on Facebook for information and news of relevance to the book.